Guy recently fully prepared a 2L TC for my 1977 124 Spider. He did a 'bench run' of the engine and everything, as expected, was sweet. However, when I first started to drive the car the oil pressure was initially OK but not great (around 15 PSI indicated at tickover). However, over a week or so the pressure got worse, to the extent that the gauge registered nearly zero at tickover (thankfully the oil light remained off). 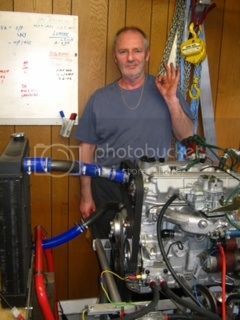 I mentioned this to Guy when I called by and, because he is so committed to his work, he immediately dropped everything and eventually managed to rig up one of his Racetech gauges. Well, the 'real' reading saw the Racetech gauge rapidly swing round to at least 50-80 psi when the engine was revved. 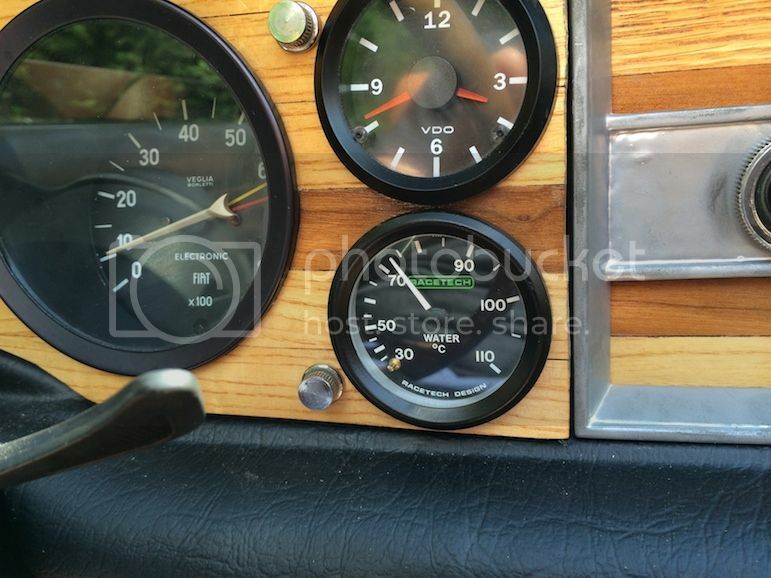 So, the lesson here is obvious, although the old gauges look nice and in-keeping, they are around 40 years old now and gradually deteriorate - besides they were never very good when new! So, if you have invested a lot of time and money in doing up your engine, or you have a standard engine and it looks like the oil pressure is low, the simple message is - GET QUALITY GAUGES! 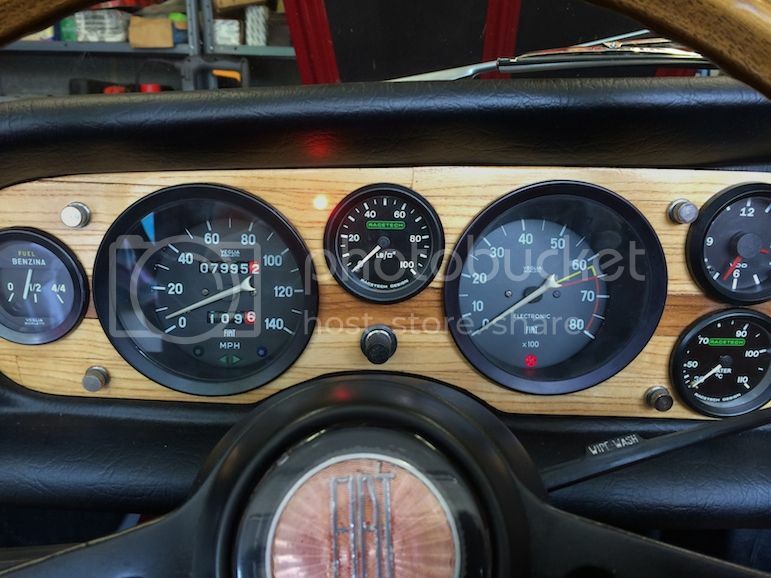 Re: Old Gauges - Don't trust them! Thank you for posting this Phil. 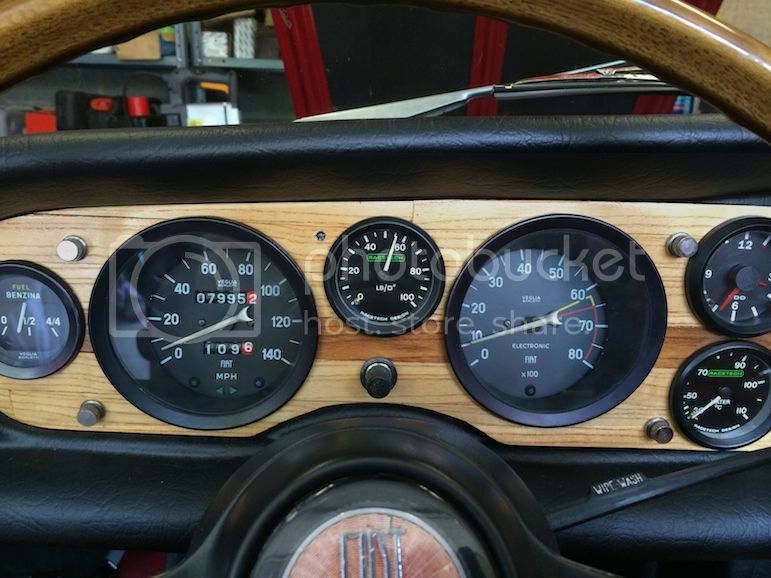 So I finally fitted Racetech gauges for both the oil pressure and water temperature. Because the Racetech gauge does not have a low pressure warning light I managed to place a small red LED in the dash which turns out to be far brighter than the old one, plus when it is off it is hardly noticeable - despite me drilling an extra hole in the dash. It looks almost white in the picture but it is a bright red. Oil pressure light out with engine running. Pressure nice and healthy at tickover on a cold engine. All the gauges have a nice long needle sweep so they can be read far more accurately. Water warming up. The nice thing is the pointers for both the oil pressure and water temp gauges are in the 12 o'clock position when the engine is warm and at normal running speeds. So it only takes a quick glance to see everything is ok. This is how gauges tend to be orientated on aircraft so that you don't actually need to 'read' the gauges but a quick glance with everything pointing up tells you everything is normal.